LeBron James and the Cleveland Cavaliers have their work cut out for them following Game 2 of the NBA Finals. To bring a title to northeast Ohio, James will have to lead the Cavs to four wins in the next four or five games. Even more imposing, it would have to come against a Golden State Warriors team that hasn't lost more than twice in a row all season. 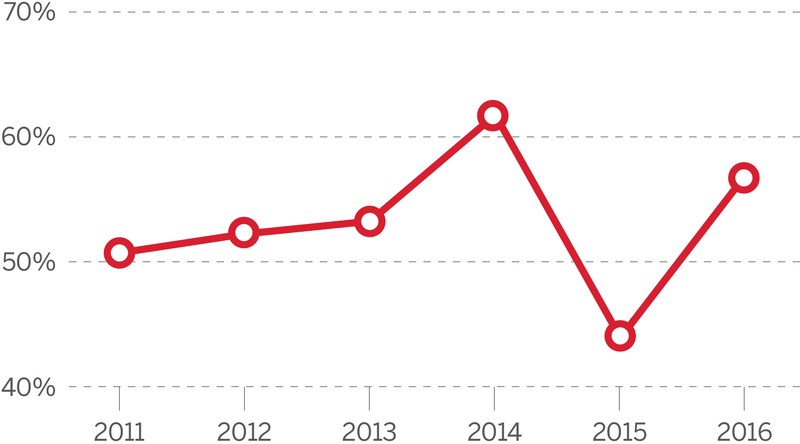 For James, playing in his sixth straight NBA Finals dating to his time with the Miami Heat, the grind of yet another long season might have started to take a toll (as evidenced by his seven turnovers and sub-50 percent shooting from the field). 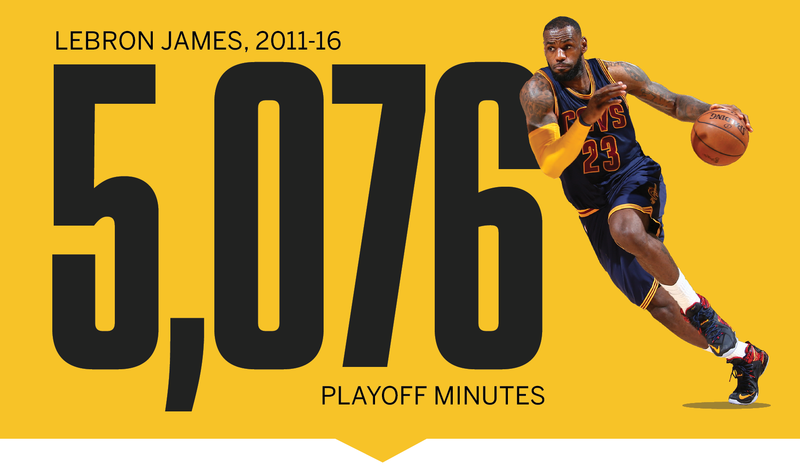 While that's hard to say with surety, this much is certain: The totality of playoff games and minutes in his six-year stretch of Finals appearances is unlike anything seen before in league history. As a No. 1 overall pick who entered the league out of high school, avoided injuries and played on teams that made plenty of deep playoff runs, James was bound to compile plenty of career minutes as he entered his early 30s. But his workload is unlike any superstar before him. In our recent #NBArank list of the top-10 greatest players of all time, he ranked third. 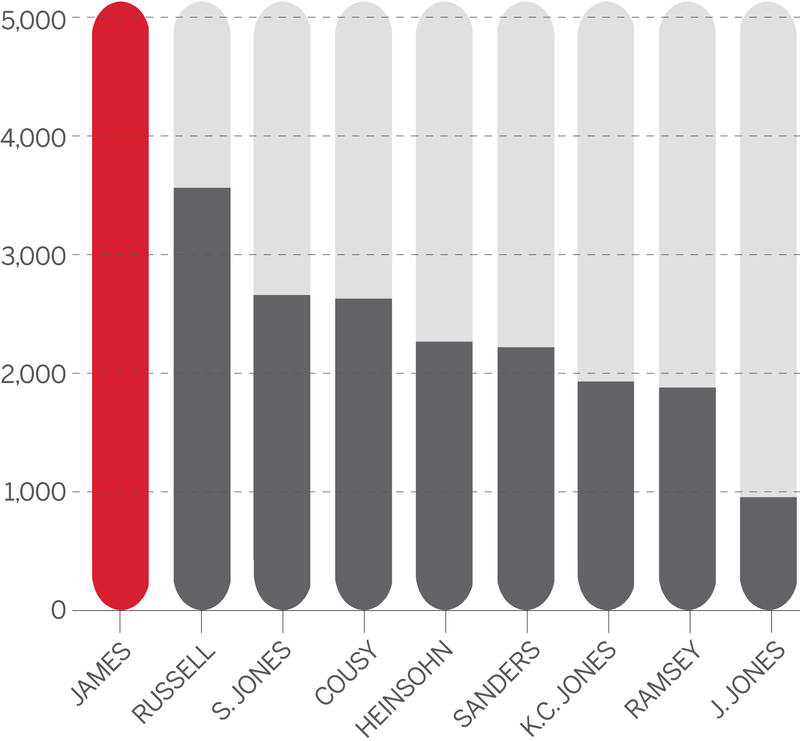 But when you compare total minutes played by the end of their age 31 season, James ranks first. His regular-season minutes alone (38,478) are more than anyone else's combined total minutes (regular season and postseason), with the exception of Magic Johnson. 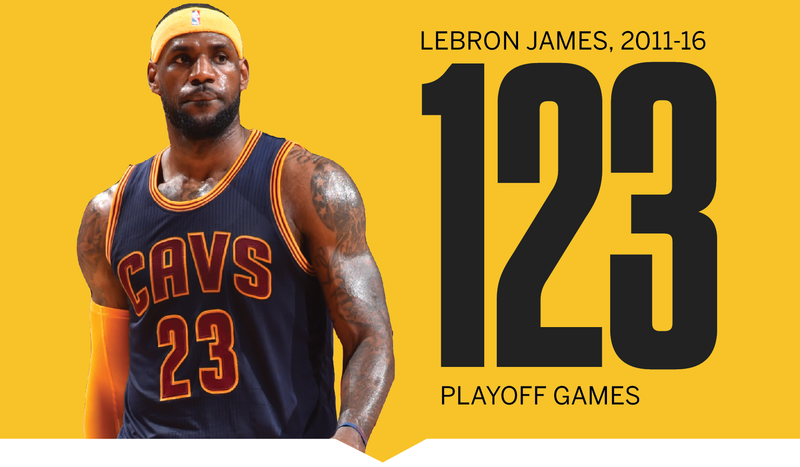 While James is not the first to reach six straight Finals, nobody has racked up mileage like LeBron in doing so. During the Celtics' reign in the 1950s and 1960s, there were fewer than 10 NBA teams, fewer playoff rounds and shorter series. Because of that, James towers over the rest of them in minutes played at 5,076, with Bill Russell second at 3,577. Comparing his cumulative numbers since 2010-11, the heavy workload hasn't stopped him from improving on his regular-season numbers when the playoffs come around. Tracking his yearly postseason usage rate and effective field goal percentage throughout the streak, you can see how Cleveland was overly dependent on him last season (37.6 percent usage rate) and he was less efficient as a shooter (.440 eFG percentage). This postseason, his usage rate is under 30 -- which is partly a by-product of all Cleveland's early-round blowout wins -- and a higher rate of shots in the paint have led to an effective field goal percentage of .567. ESPN Stats & Information looked through every six-year stretch in NBA history and compared total playoff games and minutes. This includes overlapping years for each player as well, and below you'll see a few names repeated because of that. The lists are dominated largely by players on dominant teams (like Larry Bird and Magic Johnson) and players from the current era, which has enough rounds and games to inflate the numbers a bit. But nobody comes close to James, and nobody's name shows up more often. 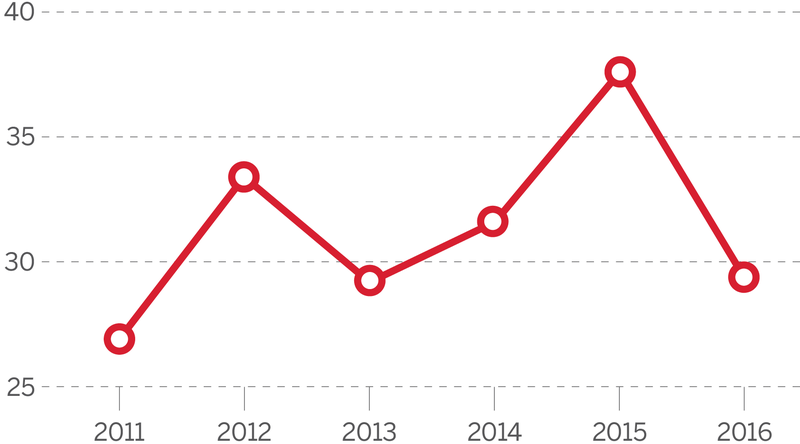 Starting with 2007-12, every successive six-year window for James has included a higher playoff minutes total, culminating with the current one. Numbers through Game 2 of the Finals. Additional reporting by Micah Adams of ESPN Stats & Information.